The Bindomatic FlexiCut binding solution is designed for short to medium runs and specialty binding, with the covers designed and printed locally by any commercial printer or print shop service. Easier, faster, more flexible and cost effective - it is simply the most powerful print shop entry level perfect bind system in the market place. Up until this point the Bindomatic glue has been available only as part of Bindomatic pre-scored, pre-folded covers. The glue now being offered as a separate commercial print application is a testimony to the continuous customer need approach of Bindomatic. 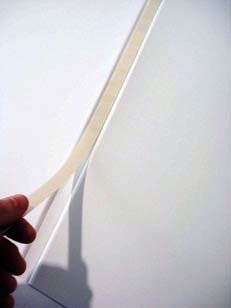 Glue sheets are cut down by user to single strips to required spine width. This flexible system will allow for any document format. The Bindomatic 5000 binder will bind documents over 2" in thickness. While it is possible to cut and bind a 1,5 mm document, the smallest recommended glue strip cutting width is 3 mm, suitable for ~10 sheets up to 25 sheets (80 GSM). 1. Design, print, cut and score the cover. 2. Print the document sheets to be bound. 3. Cut the FlexiCut Glue to same width as scoring width, and position glue strip inside the folded cover. 4. Insert sheets into cover and load document/s into binder which will start the binding process automatically. 5. When binding cycle is completed (~60 sec) the binder will prompt operator to move the document/s over to the cooling rack - after cool down of ~2 minutes the document/s are ready for distribution. It has never been easier for a commercial printer to offer a personalised professional impression! Width 200 mm x Length 280 mm x Thickness 0,8 mm. 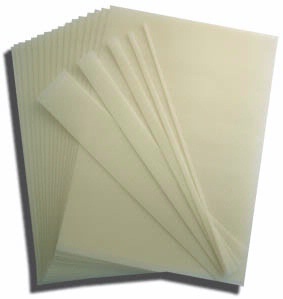 Quantity of 18 separate sheets in a single carton. Sufficient to bind for example 375 copies of a 9 mm document. The Bindomatic 5000 binder can bind documents over 50 mm in thickness. Depending on paper thickness this corresponds to +500 sheets in one cover. It is also possible to bind FlexiCut documents simultaneously, up to ~10 at a time (per minute).